The Metamorphosis of Packaging: What’s Next in E-commerce? In the scope of work it takes to bring a product to market and into the hands of the contemporary consumer, what remains paramount in purpose is for the “package” to generate a consistent, positive effect – to connect with the consumer on an emotional and intellectual level, leaving the consumer feeling confident, satisfied or advantaged in selecting one product over the alternatives. However, I, can’t help but think that the impact of e-commerce calls for a refocus of creative direction and brand design standards. Whether it is evolving or emerging, it is certain that packaging as we know it is going through a metamorphosis. In the recent past, the biggest problem for visual and brand design on the packaging was addressing how design standards would adapt to variations of size and format with flexibility and integrity. Let’s face it – a package the size of several postage stamps has to be different than a face panel of a full-size package. For instance, consider the design for a bottle, can and carton for a soft drink product or the differences created in a product line with both rigid and flexible packages – all require consistency and continuity of the brand and graphic design to sustain and link products. Consumers still deal principally with a physical store shelf – an environment where competitive packaging co-exists with brands and products, and where they have the ability to consciously and somewhat interactively discriminate in their decision-making. If the colors and images align with their perception of quality and appeal to them more than the competition, and they feel the product is meritoriously priced – with repeated selection and purchase, you can establish brand loyalty. While purchasing patterns rely on these established cues, product selection in some cases can become almost automated once they are imprinted (i.e., reach for the red and white can if you need soup). If there is any doubt about a competitor, in the conventional market consumers can pick up the package to “feel” the difference or examine product features in detail. 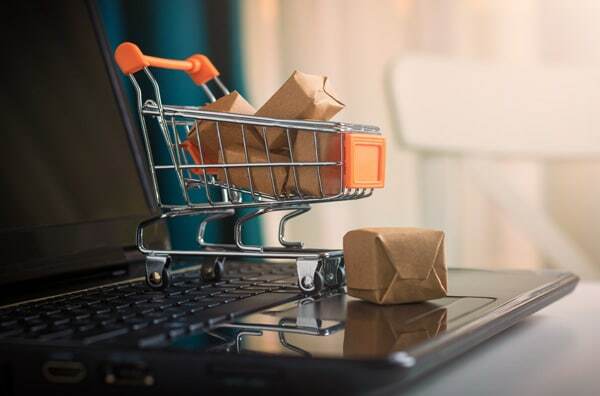 E-commerce has revolutionized how consumers discriminate in making product choices, altering the relationship they have with a package and ultimately with a product. If you are shopping online, no more do you have the tactile experience of holding or moving around a package to feel the weight or evaluate volume or surface feel. You can only rely on descriptions or reviews, which as any seasoned online shopper knows, often veer pretty far from the truth. Consumers can no longer rely on consistent, accurate color cues, as screens on devices project color and image quality differently – and not necessarily in sync with deliberate and distinct brand colors that creative teams work so hard to actualize – all of which have been selected to be most effective when the consumer sees the physical package. Additionally, it is far more complex to create and sustain retention and impact when you have to toggle between screens or pages to qualify or make your selection. Shopping online also makes competitive visual differentiations challenging, with products no longer in 1:1 proximity. While product sales are in large part the result of an Omni-channel strategy, it pays to take the time to understand and incorporate all the nuances of each channel and the relationship the customer experiences within each channel as you begin to develop your packaging graphics. Hopefully, effective packaging will be the result of design solutions created and managed for equal impact in all channels, with creative solutions that deliver equal impact. It is clearly not realistic to have separate packaging for separate environments, so from a design standpoint, creative teams can do more to keep brands effective by keeping packaging concepts simple, bold and clean. The speed at which the human eye reacts to an image changes in both environments as well as the speed of formulating a purchase decision. Viewing a digital package at a quarter to a tenth of its normal size may cause elaborate detail to fall away or leave the impression of clutter. That doesn’t mean you create a design that is boring or dull but you should be very purpose driven in what you fill your package design with, or modify for online purposes. Defining and differentiating products on shelf is a challenge, and the complexity of the digital marketplace puts an additional level of complexity on the table. Has the conventional “shelf” gone away? Not for quite a while. The challenge is in how the package on the shelf makes the jump to the digital cart.